Nizhny Novgorod: Stadium to get out of the red 7 years after World Cup? 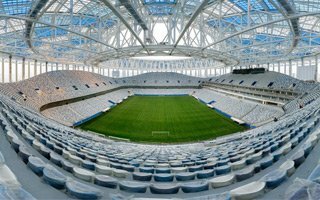 There's no chance for recouping the construction cost, but new 2018 World Cup venue in Nizhny Novgorod could become self-sustainable financially within 5-7 years after the tournament. At least according to the governor. During last week's Gaidar Forum the governor of Nizhny Novgorod Gleb Nikitin assured that the city's 2018 World Cup stadium will eventually break even. “According to our forecasts, the period of the stadium's run into self-sufficiency will be 5-7 years, with annual operating cost of about 300 million rubles," Nikitin said. RUB 300 million represents roughly €4.3 million at present. At present it's not even certain whether the governor will indeed operate the stadium. Sources suggest all federal World Cup stadiums could remain under federal management for the first several years of their operation. What may be considered surprising is the optimism of Nikitin's claims. At present the city has no Premier League club and the only major traditional side, FC Volga, was dissolved back in 2016 due to unpaid debts. Its successor is FC Olimpiyets, which started playing in the 3rd league in 2015 and has since moved to the First Division (2nd league). However, it's yet to develop a strong following, let alone having a chance to continuously fill a 45,000-seat stadium, something not achieved even by the greatest Russian teams. Meanwhile at the construction site almost everything is done. Last week the membrane facade cladding was finished, one of the last elements of actual construction. Now it's mainly furnishing and clearing works. Though the December 2017 deadline hasn't been met, delay is slight and will not impact the stadium's launch. In recent days Glavgosekspertiza Rossii gave positive evaluation of the delivered works worth estimated RUB 17.9 billion (€258 million).